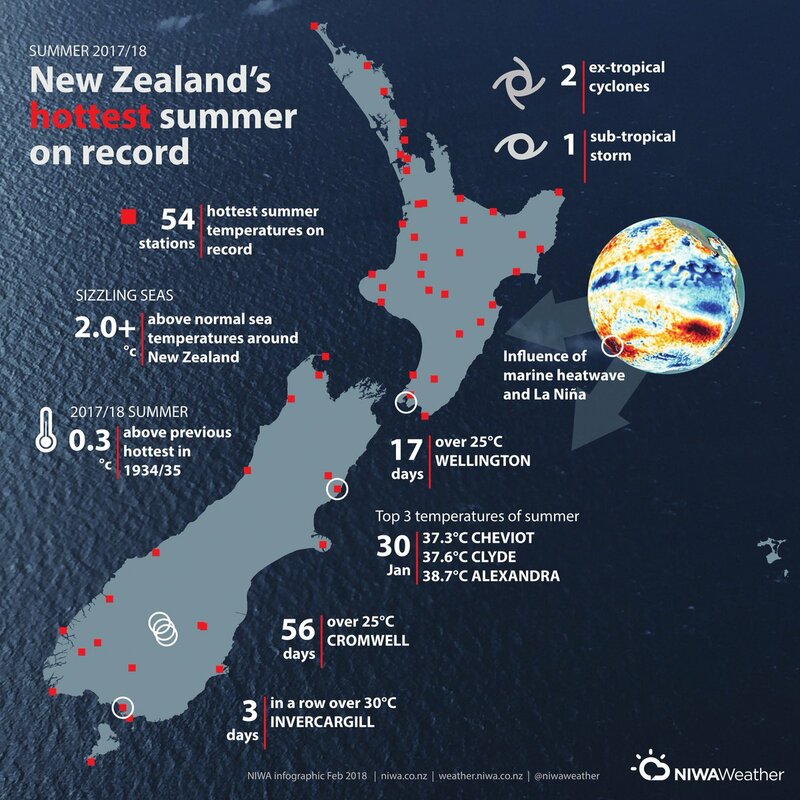 NIWA reports that New Zealand’s 2017-18 summer has been the hottest on record. The hottest summer on record by 0.3°C. The #marineheatwave had seas up to 6°C above average. Alexandra reached 38.7°C on 30 Jan, NZ’s hottest Jan temp in 39 yrs. Above normal amount of ex-tropical cyclones (2). Our summer was shaping up as a very dry one too, until the ex-tropical cyclones brought in some heavy rains. Apart from noticeably nice weather in Dunedin there have also been significantly different growing patterns, with things like tomatoes and grapes doing much better than usual. Note that this is a weather record for three months, but it inevitable raises questions about how the climate could be changing overall. Unseasonably warm weather in the Arctic Circle, which pushed cold air down onto the US and Europe, have also been unusual. Trade war possible between Australia and US? Its been a great summer, if only they were all like this. I note there have been no adverse issues so thats it for me global warming is what we want perhaps with just a tad more carbon dioxide to really get that plant growth booming. I see Antarctica has freezing accelerating according to our own scientists who clearly got that one wrong..at least they are consistently wrong. Made up for last summer which was crap. December was great since than we have had rain rain followed by more rain. One drill in the Ross ice shelf found the ross ice shelf is not melting the Antarctic is losing ice. The usa had a brutal winter . That would be You …. Who cares Griff, temperature changes and we adapt and thrive. I would hate to be one of those believers in catastrophic climate change, what a miserable existence waiting for the end of days and bemoaning all the amazing strides humanity has made. Whingeing gits the lot of them. Hello David if you did not care you would not have lied . Get caught telling lies and come back with a distraction. Your view is shared by a few nutters . My view is its quite amusing when the likes of yourself spend endless hours studying reports that tells you that the climate changes and that scientists agree with your genius. Well the sun shone this morning and its raining this afternoon so even I agree that the climate changes, the climate has always changed although lately not to the degree we have been warned about. I guess wasting your life worrying about something that isnt really happening would leave you a bit prone to over reacting to a differing opinion to your own. Thankfully the proof is on my side at the moment but you win on the computer models and pretty graphs. Average Temp- 18.8 Celsius. New record. Previous record- 18.5… in 1935. So in terms of raw data it isn’t a record then as 1934/35 has been adjusted downwards by NIWA by around 0.7 Celsius overall. i’m not sure. I just reported the figures. Are you using a mathematical formula? Careful with those pesky facts Corky. No one knows the mathematical formula that Sallinger used to adjust the temperature records downward before he was fired and exposed as a key player in those leaked emails, he probably just lopped off a degree or two so “hide the decline” makes records a bit useless. Invercargill is mentioned as well – hottest day ever recorded beating the previous record set in….January 1921. Deniers eh! What cn ya say! tautoko RG.. still C-C deniers, massing; led by Mr T etc. I still remember when CO2 was about 300ppm (1970s) I hear it is above 400ppm in 2018 ! One thing you seem to be avoiding/ignoring.. whilst there has been the odd peak, in the past, the general trend is definitley RISING. The RISING has been happening since the little ice age largely during times where CO2 was never a factor. Crap, Zedd. I have always said the planet is warming but that the issue is how much and whether it matters. Don’t try to misrepresent me. I always thought you were a bit of a space cadet Alan. We don’t live in the troposphere at ten kilometers. Thats Roy “God wouldn’t allow global warming” Spencer’s series . Same data just a better record at getting their work right with out others having to correct it for them . The RSS chart shows the same pattern for Jan/Feb. So does HadCRUT at least for Jan – it hasn’t published Feb yet. So just spare us the crap and pull your head in till you have something sensible to say please. I can’t say that it’s been a great summer in the Waikato. It’s been humid for months, with very few days when it hasn’t been sticky heat, even at night. 36o+ and humidity are awful. Thank goodness I bought extra fans early. One ends up drenched with sweat doing things that aren’t really strenuous. It’s been a good summer for shops selling fans and aircon, I suppose. Wasn’t a hot February over in Western Australia. Seems this “global warming” has a distinct regional signature.